A cluster of six white diamonds are inset into the heart-shaped ring in 14k white gold. Diamonds weigh a total of 0.04 carats in H-I Color, I1 clarity. 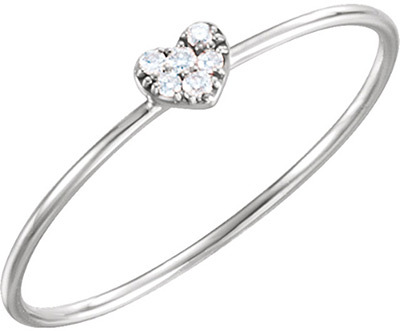 This cute heart ring is also available in 14k yellow or rose gold, shown below. The ring is available for women in sizes 5-9, including half sizes. Ships free in the U.S.! (international available). We guarantee our Diamond Cluster Heart Ring, 14K White Gold to be high quality, authentic jewelry, as described above.